British designer Andy Waugh has drawn Revolution, a muscular 45m motor yacht concept that wraps a conventional interior in radical styling. Revolution, which is designed on a proven hull-form, features boldly faceted exterior surfaces, a vertical bow and a coachroof split into a trident shape. 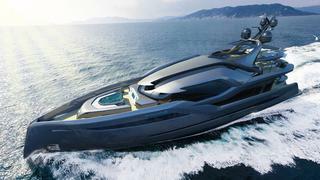 Inside, the design contains similar accommodation levels to other 45m yachts and has a conventional layout. The main deck houses the master suite and main saloon, while four guest cabins and crew cabins are on the lower deck. On the bridge deck is an informal lounge or cinema space leading to an alfresco dining area. In all there are four deck areas that in the current specification include two pools, one at the bow and the other on the sundeck and a sociable seating area on the main deck aft.